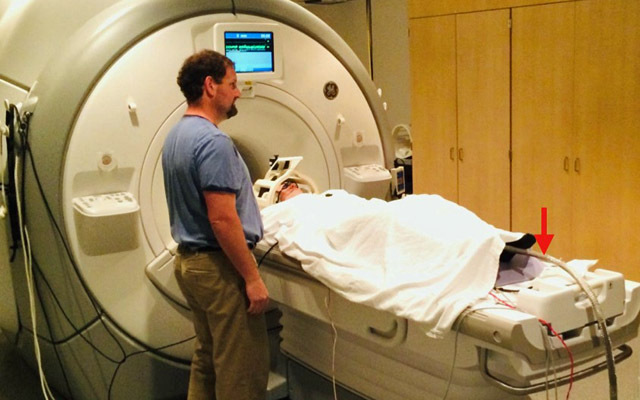 A study participant undergoes fMRI while a heat stimulus is applied to his leg (red arrow); senior author Alan N. Simmons, PhD, associate professor of psychiatry at UC San Diego School of Medicine and director of the fMRI Research Laboratory at Veterans Affairs San Diego Healthcare System, looks on. Co-authors of this study include: Bryan Davis, Linda Sorkin, James Proudfoot, Edward Zhong, Donald Kimball, Ramesh Rao, UC San Diego; Mingxiong Huang, Charles Huang, Andrea Spadoni, Dewleen G. Baker, UC San Diego and Veterans Affairs San Diego Healthcare System; Bruce Simon, electroCore LLC; and Irina Strigo, Veterans Affairs San Francisco Healthcare System. This research was funded, in part, by the Veterans Affairs San Diego Health System through the Center for Stress and Mental Health.